I was supposed to go out to dinner tonight to see an old friend’s Mum. However, I think I twisted my back in the excitement of the World Cup finals! So panadiene it was, and I was in no fit mood to drive. After a little nap, I decided I needed to try and cook something comforting, soothing, and nurturing. So I looked in the fridge, and on the counter (new organic delivery today!) 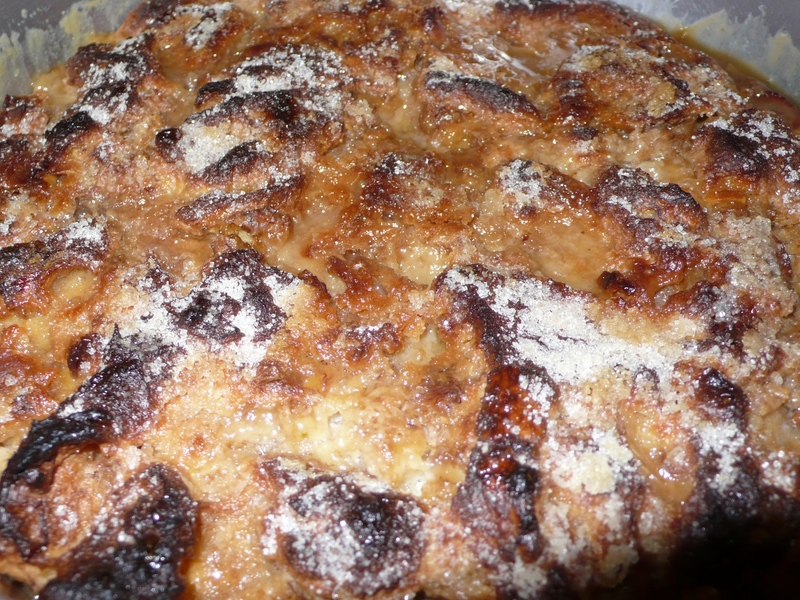 and pieced together this bread pudding. Oh my, YUM! So good. So simple, and very quick to make. Just the thing for making a sore back go away. Heh. Just a note. I literally used what I had in the fridge. It worked out really well. If you have dont have port wine, for example, you could substitute it with a little wine or liqueur or some juice. If you dont have bread, but only croissants, go ahead and use them! Dark chocolate, and no white? Substitute lah. This is a very forgiving recipe. I baked this in a round cake tin. You could use 2 loaf tins, or a square tin if you like. Serve with sour cream on top for a really lovely contrast. First of all, toast your bread in the toaster. This will dry out the bread, and also caramelise it (thats what the brown is – the sugars in the bread caramelising) and will add tons of flavour. Leave to cool. Meanwhile, melt the butter in a large non stick pan over medium heat. Once the butter is sizzling, sprinkle 2 tbsp dark brown sugar over the butter. Dont mix, but just let the sugar melt into the butter. Slice the bananas over this and let cook for a few minutes. Using a spatula, gently flip the bananas over, and add the teaspoon of vanilla and port wine. Let the bananas cook for about 3 – 5 minutes in this gorgeous sauce, and then take off the heat and let cool to lukewarm. In a large bowl, beat together the eggs, milk (see note above), sugar if you are using, salt and tablespoon of vanilla. Gently mix in the cooled banana with all its juices. Tear the bread into chunks and add to the bowl, and mix well. Add the white chocolate chunks and stir to combine thoroughly. Let this mixture sit for at least 10 minutes, while you preheat your oven to 180C. You want almost no liquid left and the bread to have soaked it all up. Butter a 9 inch cake pan, and pour the mixture into the pan. Bake for 40 – 45 minutes, sprinkling a little brown sugar over the top 5 – 10 minutes before the cooking time is over. You will know its read when its risen and puffy, and there is no more liquid when you pierce the bread pudding with a knife. Serve warm with a little sweetened sour cream on top. Soul comfort food.